Fu Ying encourges Overseas Chinese in UK to Build "Harmonious Chinese Community"
In the evening of December 17, H.E. Mme. 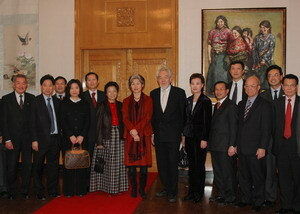 Ambassador Fu Ying held a new year banquet in the Chinese Embassy for principles of major Chinese associations in UK. Fu Ying thanked the overseas Chinese in UK for their contributions to development of Sino-UK relations and asked the principals to convey her greetings of Christmas and New Year to all overseas Chinese in UK. Fu Ying introduced the spirit of the 17th CPC Congress and elaborated on the concepts of scientific outlook on development, harmonious society and harmonious world. She denoted that "harmony" is the essence of Chinese culture and one of the bases for survival and development of overseas Chinese. She hoped that the overseas Chinese in UK could carry forward good traditions of close unity, mutual assistance, fighting against "Taiwan secessionist" and promoting unification. She encouraged them to establish good relations with local governments and people, promote exchanges and cooperation between old and new immigrants and Chinese associations, jointly build a "harmonious Chinese community". Fu Ying reported the recent visit of Chinese Foreign Minister Yang Jiechi to the UK and exchanged views with the principals on current Sino-UK relations, development of Chinese economy, good image of the overseas Chinese and solving the shortage of Chinese cooks. 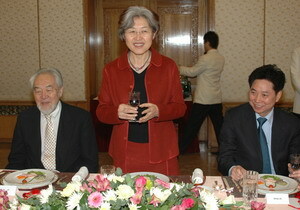 The atmosphere at the banquet was warm and harmonious. The principals denoted that they are proud of marvellous development and progress of China, proud of its increasing influence in the international affairs, excited for continuous healthy development of Sino-UK relations. They will actively strengthen connections between the Embassy and all sides in China, build a "harmonious Chinese community", safeguard the rights and interests of the overseas Chinese in UK, and promote all-round cooperation between China and UK. At the end of the banquet, Fu Ying presented the commemorative stamps of the 17th CPC Congress and the calendars on Beijing Olympic Games to them. The banquet is an important event held by the Chinese Embassy before Christmas and New Year for exchanges and communication with the overseas Chinese circles in UK. 24 principals of major overseas Chinese associations in UK, including Dr. Shan Sheng, President of Association of All Overseas Chinese in UK for the Promotion of China's Unification, Deng Zhuting, President of London Chinese Chinatown Association, Ye Huanrong, President of Tsung Tsin Association, UK, Zeng Tiansong, President of Ji'ao Countrymen in Europe, Qiu Baixi, President of Birmingham Overseas Chinese Association, Li Zhenju, Director for Chinese Participating in State Affairs of UK, Feng Qin, President of China-Britain Technology Trade Association, He Zuojun, President of Shunde Sodality, Wu Shanxiong, President of UK Association for the Promotion of Chinese Education, Pan Tianfu, President of Confederation of Chinese Business, UK, Wen Haitang, President of British Justice Association of Industry and Commerce, Lai Chunhua, President of Association of Chinese Women in UK, and Counsellor Jiang Yuansong and Counsellor Lin Xu were present.